It doesn’t take much searching for “Brazilian desserts” for this sweet treat to appear and reappear. Made from just three ingredients, it’s a staple served at birthdays, weddings and other special occasions. The origin of these sweet treats is unproven lore, but nonetheless amusing. Brigadier Eduardo Gomes made a run for president of Brazil in the 1940s. These candies, made by his wife, were a fundraising effort. (BTW, he did not win the election.) Named for Mr. Gomes’ military title, brigadeiro grew in popularity in the 1940s as an inexpensive dessert made from simple, available ingredients and remain a national favorite today. 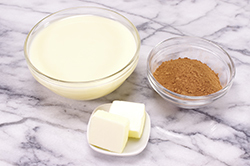 The sweet milk reduces and caramelizes through cooking altering the texture as it cooks. Different flavors abound through additions or simple substitutions. 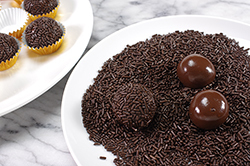 In fact, brigadeiro boutiques feature traditional brigadeiro and many variations in thriving storefronts. 1. Melt the butter in a 2 qt. 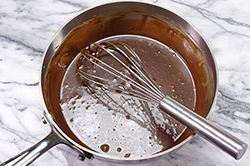 saucier, add the cocoa powder whisking to remove any lumps. Add the milk and cook over medium-low heat. Whisk the mixture as it thickens (especially toward the end), about 10-12 minutes. 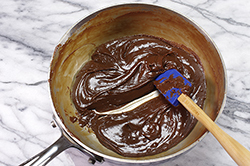 The mixture is done when it pulls away from the side of the pan, or when the pan appears as a spoon is drawn across the bottom. 2. Remove from heat. Spread the mixture on a large buttered plate to assist in cooling. 3. When cool enough to handle, roll into small 1-inch balls, about 20g each. Buttered hands will make the rolling process easier. Immediately roll in the chocolate sprinkles, and place in a small paper liner. 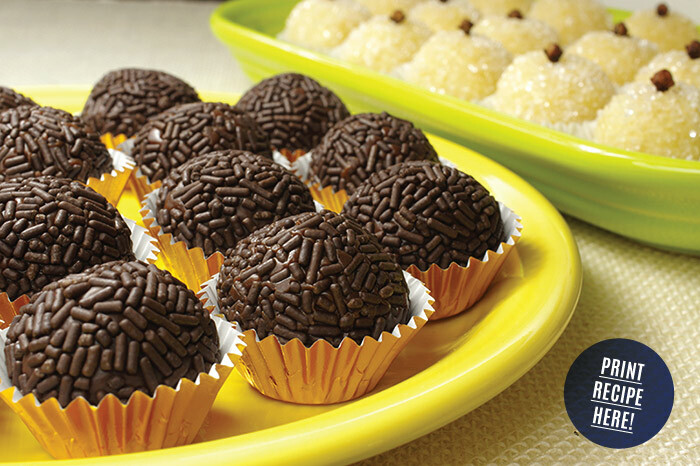 The brigadeiro may be stored at room temperature for 2 days, or chilled in the refrigerator for up to one month. 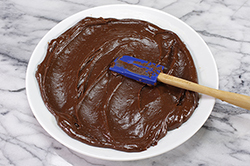 Beijinho – Omit the cocoa powder. Add 3/4 cup of finely shredded coconut to milk once cooked. Roll the balls in more coconut or coarse sugar. Garnish with a single whole clove on top. Cajuzinho – Add 3/4 cup of finely chopped peanuts to the mixture once cooked. Shape small pieces into oblong, pear-shapes. Place a cashew in the larger end to simulate the cashew fruit and its nut.